For many Kent State University students, Kent itself may feel far away from “home sweet home.” You’ve traveled across the United States, or perhaps even the world, to come here and study toward a bright career. College isn’t for everyone, and so taking on the academic challenge and subsequent mental stress is, to be sure, respectable. Whatever path you choose and however many hours you spend cramming information into your brain, one thing remains consistent among all KSU students: you’re living here. Unless you’re one of the brave who happens to live in a nearby community and drives to their classes (we can’t imagine trying to park on campus every single day), you’ve done your research on Kent apartments to find an affordable apartment near Kent State University. We’ve Optimized Our Space. Now It’s Your Turn! 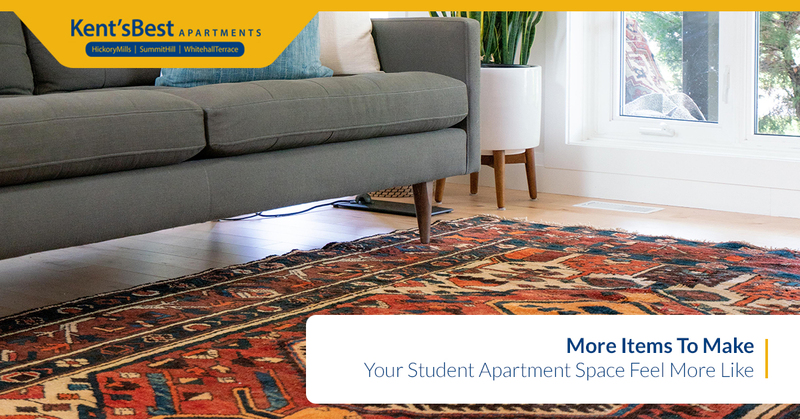 That much may be obvious, but what’s not so obvious to your average collegiate bookworm is that your apartment living space matters. You’re here for awhile — at least until you finish your undergrad. Why not get the most out of your college living situation? Kent’s Best Apartments can help. While we’ve taken care of community amenities at the Hickory Mills Apartments, Summit Hill Apartments, and Whitehall Terrace Apartments, it’s up to you to decorate and optimize your apartment living space. Let’s take a look below at several items worth investing in to make your living space more enjoyable, comfortable, and home-like. For more practical apartment essentials, read here and here. For some, empty wall space is no issue, but for others, any exposed, blank wall space just doesn’t come across as inviting. A great way to fill a good amount of space is with a tapestry! Doing so can really change the mood of a room while adding a lot of color and life to it. A desk with a good amount of surface area and workspace should be an implied essential for every college student. It’s true that there are many areas on campus to study and do your work, but it’s good for your brain to switch up where it is that you’re studying. It’s also beneficial to have a go-to home base for all of your academic operations, and that’s exactly where the right desk comes into play. Finding a good deal on a desk and subsequently moving it might be a pain in the rump, but it’s worth it to find a desk that you’ll actually like and use. Yes, Himalayan salt lamps have definitely been a trendy item over the past few years, but for good reason. They emit this warm, inviting, orange glow into an area that just makes you feel…nice. In light of battling academic stress and maintaining your sanity throughout college, trading $20 in exchange for a peace of mind is certainly a good deal. Your bedroom already has nice carpeting, of course, but a tasteful and plush area rug will really take your bedroom comfort to the next level. It doesn’t even have to be that large, just big enough to stand on and tie together a certain area of your room. We understand that quality rugs are typically absurdly expensive, so this probably isn’t a high priority of yours. If you happen to find a good sale at Walmart or Target, however, we’d say that you just go for it. You’re already paying rent every single month, so why not pay just a little bit more to thoroughly enjoy your space at our apartments? There’s no way to capture memories quite like pictures. Instead of leaving some of your favorite polaroids and photographs stuffed inside of a photo album or scrapbook (hey, it’s totally acceptable if you like to scrapbook! ), why not proudly display some of your favorite memories in an artistic and aesthetically pleasing fashion? If you’re looking for a more modern way to decorate with memories, there are plenty of digital options out there for showcasing your favorite images and videos as well. Whether your friend is crashing on your couch or you wake up feeling a little bit chilly on a cold and lazy Sunday morning, having a blanket or two on-hand is a welcome thing. Bonus points if your blankets are extra soft! A good blanket might be a little bit pricey, but it’ll serve as a worthwhile and lasting investment. Indoor plants are great because they’re typically hypoallergenic (depending on what you get), add color to a corner of a room, help purify the air inside of your apartment, and they don’t require a green thumb to keep alive. Some sun exposure and occasional waterings should be plenty to keep your houseplants growing steady and strong. Common examples of easy-to-maintain houseplants include the Spider plant (don’t let the name deter you! ), Peace lily, Philodendron, Common ivy, fig, and Aloe vera. If you’re going to spend many hours cooped up inside of our Kent apartments studying, you might as well make it feel like you’re outside. Let Us Know How We Can Better Accommodate You! A better living situation only leads to more academic success, so if there’s anything you need from our Kent apartments, please don’t hesitate to contact our friendly apartment staff about it. If you’d like to read about more tips, tricks, and general advice directed toward college students like you, check out more of our blog posts!